City Code Section 238-8.C provides that bi-monthly sewer charges shall be adjusted for water that does not reach the City's sanitary or storm sewer system, provided the user install, maintain, and repair, at his own expense, a meter satisfactory to the Department of Public Utilities. Meters that satisfy the Department of Public Utilities' specifications are sold at the Billing Office located at City Hall. This 5/8" meter is suitable for outside faucet and hose connections. Exclusion meters are used to record outside water usage that does not return into the sewage system. 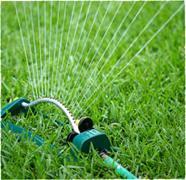 Examples include water used in washing your vehicles, watering your lawn, and other outdoor purposes. A sewage credit is issued on your bimonthly bill for this usage. Exclusion meters may be purchased and picked up at the Billing and Collections Office at City Hall. Meters require proper installation, care and maintenance. Never expose a meter to freezing temperatures. Meters should be drained and stored inside during the late fall, winter, and early spring months. Keep the meter free of debris such as dirt, sand, and mud. Flush the garden hose before connecting the meter. Determine that water flows through the meter in the proper direction by observing directional arrows on the meter. Remember, meter installation, maintenance, and repair are the customer's responsibility. The City will only replace meters that were defective when shipped from the factory. The City does not provide a warranty for meters. You may also submit your water exclusion meter readings online. You will need your Exclusion Meter Number and your Reading. Credits shall be determined by applying effective sewer rates to the volume of water consumed since the last reading. If there has been a rate increase since the last reading, the credit will be pro-rated using old and new rates. The credit will be reflected on the next monthly bill. A random selection of all meters receiving a credit will be verified monthly by the City. For more information, please contact Dianne Piotrowski, Utility Billing, at piotrowskid@colonialheightsva.gov.